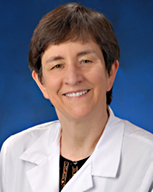 Department of Family Medicine > Residency > faculty-bios > Kathryn Larsen M.D. I am from the town of Wenatchee, Washington, in central Washington State, and attended Washington State University for premedical studies. I was fortunate to attend the University of Washington School of Medicine, which has a national reputation for excellence in primary care education and training. I then completed my family residency at UCI and remained as a faculty member after my residency. I have held multiple roles as a faculty member, including a 10-year tenure as Chair. I currently see patients at the Gottschalk Plaza in Irvine, where I precept third-year clerkship students; attend/proctor residents at the Sana Ana clinc; teach health maintenance and a family medicine simulation session for the third-year clerkship; and serve on several university and Medical Staff committees. I have two children, both currently in schooling for careers in health professions. I am interested in disease prevention and health maintenance. I am the UCI PCP liaison for the UC-wide Athena Breast Healthcare Network. This is a network dedicated to improvement and innovation in prevention and risk assessment, diagnosis, and treatment of breast cancer. We are currently developing new questionnaires to help evaluate relationships of various health components and lifestyle factors to risk for breast cancer. The UCI program is directed by Dr. Hoda Anton-Culver and Dr. Hannah Park in the UCI Department of Epidemiology.